For the Hill children – 6-year-old Chrislyn, 4-year-old Christopher and 1-year-old Christian – the “A is for Africa” show at Busch Gardens’ Sesame Street Safari of Fun recently featured a surprise ending that was many months in the making. The children’s father, Air Force Staff Sergeant Christopher Hill, had been deployed to Zabul Providence, Afghanistan since early 2011. 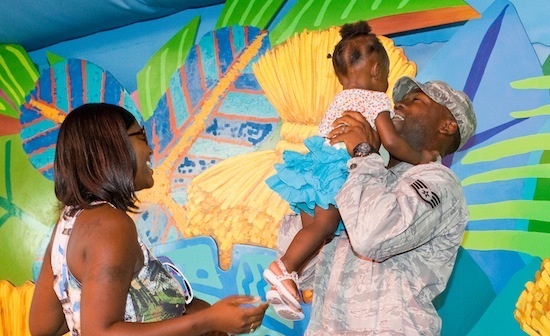 After more than seven months away from his family, SSgt Hill and his wife, Frances, wanted the perfect surprise homecoming to reunite him with his children – the youngest of whom started walking while he was away. At the finale of the family-friendly show featuring the Sesame Street characters, the stage attendant announced that they had a special guest to introduce, but they would need special help from the audience (and a wave of Abby’s magic wand) to bring him all the way back from Afghanistan. After a tearful reunion, the family posed for photos with their Sesame Street friends onstage, and 4-year-old Christopher thanked Elmo for bringing his father home. Ssgt Hill is stationed at MacDill Air Force Base. Precious! Kudos to Busch Gardens.